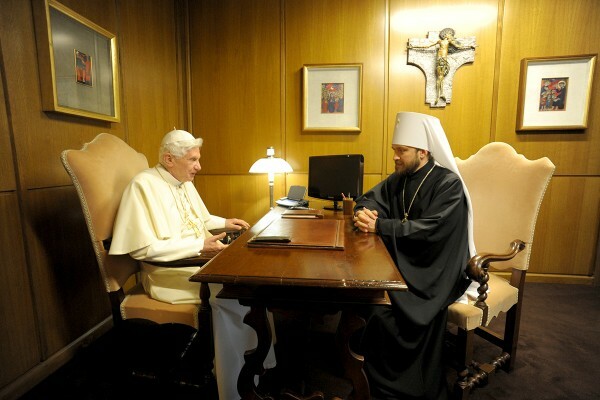 On October 6, 2014, Metropolitan Hilarion of Volokolamsk, head of the Moscow Patriarchate’s department for external church relations visited Pope Emeritus Benedict XVI at his residence in the Vatican. The DECR chairman is in Rome for the Extraordinary Assembly of the Synod of Catholic Bishops, with the blessing of His Holiness Patriarch Kirill of Moscow and All Russia. The DECR chairman conveyed to the honorary pontiff best regards from Patriarch Kirill. During their talk, in which Cardinal Kurt Koch, president of the Pontifical Council for Promoting Christian Unity, participated, they touched upon a number of topics including the Orthodox-Catholic theological dialogue, as well as the situation in Ukraine. Metropolitan Hilarion shared his impressions of the participation in the work of the Synod of Bishops devoted to the family and pointed to the timeliness of comprehensive discussion on problems involved in the institution of the family and the need to protect traditional family values. On his part, Pope Emeritus Benedict XVI shared his remembrances of meetings with Patriarch Kirill of Moscow and All Russia when he was Metropolitan of Smolensk and Kaliningrad and DECR chairman. He conveyed to Patriarch Kirill best wishes of good health and underlined that he prayed everyday for peace in the Ukrainian land. As a token of the meeting, Metropolitan Hilarion presented the honorary pontiff with a bust of one of his predecessors, Pope Benedict XV, executed by Russian sculptor A. Burganov. It was this pope who Patriarch Tikhon addressed with a letter written in Latin during the severe famine in 1921. On the same day, Metropolitan Hilarion met with Russia’s Ambassador to the Vatican, A. Avdeyev. During a long talk, they exchanged opinions on a broad range of issues of mutual concern. They were joined by Archimandrite Antony (Sevryuk), secretary of the administration of the Moscow Patriarchate parishes in Italy.